IMO a magnificent flag at this site or a bigger image at this page. 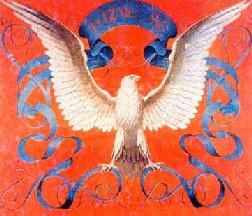 "Sokol" = falcon, symbol of the Czech gymnastics; clubs with very strong nationalistic feelings were founded since 1862. Czech Sokol Organization (CSO) is the fourth most numerous civic association in the Czech Republic, whose 180 000 members participate in sports, sporting activities in Divisions of Sokol Versatility and cultural activities, mostly in folk and marionette groups. CSO is one of the oldest organizations of this type in the world. The philosophy of CSO is associated with the emancipation struggle of the Czech nation in the 19th Century. The idea of physical education as well as the promotion of moral values was formulated by Miroslav Tyrs, a professor of the Charles University, and by Jindrich Fugner. The philosophy, evolved from the ancient Greek ideals of "kalokagathia" and now propagated by Miroslav Tyrs and his followers, became the basis of the movement, which is connected with the origin and destiny of the Czech (Czechoslovak) Republic. Four times Sokol was banned or its activities were restricted by wars or totalitarian regimes. It was still alive, though- in other countries, in communities of Czech immigrants on all continents of the world. In 1989, when the communist regimes in eastern Europe collapsed, the CSO was restored after a break of 42 years. The program traditions, connected with the physical education of a man responsible for himself, for his community and for democracy in his country, was renewed. While entering a new century, the CSO modernizes its program. It supports 57 kinds of sports, which are being organized in the CSO. At gymnastics, handball, basketball, judo and athletics Sokol sportsmen reached the highest levels of national and international competitions. The CSO also supports new kinds of sports, for example acrobatic rock'n'roll, at which the members of Sokol won the World Championship. The most numerous part of the CSO is the Division of Sokol Versatility, in which the program of sporting activities is made. This program includes wide range of sporting activities for people of all ages and abilities, including for those who are handicapped. Sokol districts and units significantly influenced the Terry Fox Run in the Czech Republic, where, like in Canada, many people participated. The most important event, that shows the abilities of the CSO members, is "Slet", a sport-cultural festival of all activities that the CSO practiced during last six years. CSO is organized in 43 districts covering the whole Czech Republic. Its headquarters are at the Tyrs House in Prague. Czech Sokol Organization is the most numerous organization of the World Sokol Federation. Jeroen van Leeuwen sent me an image of a poster with the modern flag of the Sokol Sporting Organization in the Czech Republic. That flag has the colors of the Czech/Czechoslovakian flag, but the blue triangle is replaced with a blue hoist-stripe, charged with a large white "S" with superimposed "KOL" in a hoist diagonal row, red shaded white.